"We're gonna start this soon. There's already a couple of attractive ladies in the front. We've got at least one cool-lookin' dude," announced Gordon Voidwell. Patrons meandered slowly away from the taco stand and arrowhead necklace displays towards the stage in the corner of the Brooklyn Night Bazaar. "I'm just waiting to feel slightly more comfortable," he admitted. Once the crowd had thickened to his liking, Gordon and his band drifted into the dreamy "Amnesia" from his one-month-young Bad Études mixtape. 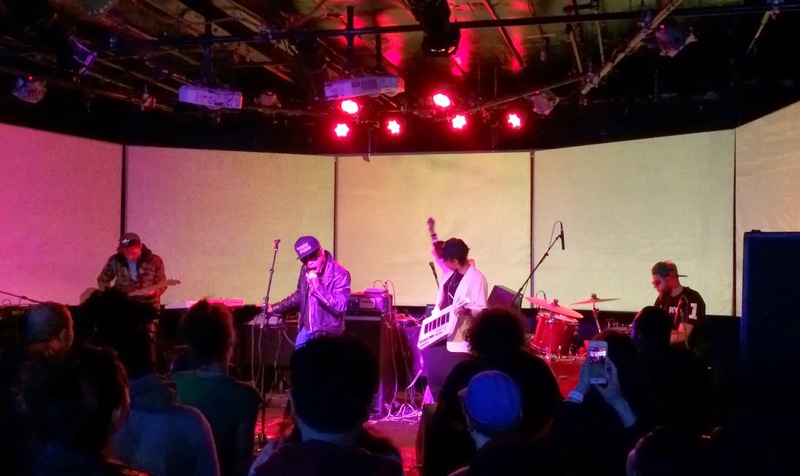 It seemed like a strange introduction, but I understood completely when they barreled into the forceful funk of "Homemade VHS" and sent shockwaves through the crowd. After the modern R&B flavor of "First Time," Gordon stripped down to a sleeveless Gucci shirt and bathing suit for the '80s pop of "Bad Way." A ring of guys to the right started a dance-off during "1 Trap Mind," which concluded with Voidwell looping and layering his vocals into a fizzling drone. They followed with the spaced-out interlude "Fixed," with Gordon joking, "We all just peaked on LSD." Voidwell often gets compared to Prince, and songs like "GF Jeans" are why. From the slinky bass of the verses to the refrain's pleading sensuality of "Daaamn, if I was your man," it could've been written by the Purple One himself. But to Voidwell's credit, as anyone who saw that episode of The New Girl can attest, even Prince isn't exactly turning out Prince-calibre material right now. Despite yells of "White Friends" from the back of the audience, Gordon ended the show there, leaving everyone wanting more (and "GF Jeans" stuck in my head for the rest of the night). Fortunately, if you want to fill your Voidwell void, he'll be DJing at Brooklyn Bowl tomorrow night (RSVP here).